This is the product range of professional tools, organization shelves, and taps that will be available on 3 April. See the ALDI Catalogue Workzone sale to see all of them. 3 April sale is nothing compared to the wider range of 6 April special buys. 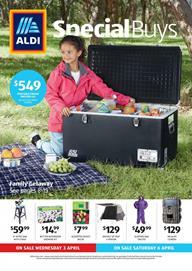 ALDI Catalogue has camping products, inflatable beds, tents, portable chairs, and essential cooking equipment to go. Also, find digital action cameras, laser range finders, wildlife cameras, and more. ALDI's camping food range is also interesting. Go to pg 12-13 for damper sticks with bacon, olive and fetta. Check out professional tools from this catalogue of special buys week 14. Also, see the cover page for portable fridge freezer with 65L capacity. Its price is gonna be only $549. Browse the details of other products on the catalogue preview. Track the ALDI Catalogue deals following us on Facebook or subscribe to get emails. Power tools might help you with an expected performance. Pay much lower for the professional tools you need.